The 2010 NHRA Auto Club Finals was one of the most exciting events held at Pamona in a long time. John Force clinched his 15th Funny Car championship on Sunday to complete an emotional comeback from a bad accident just 3 years earlier that had left his racing career in doubt. 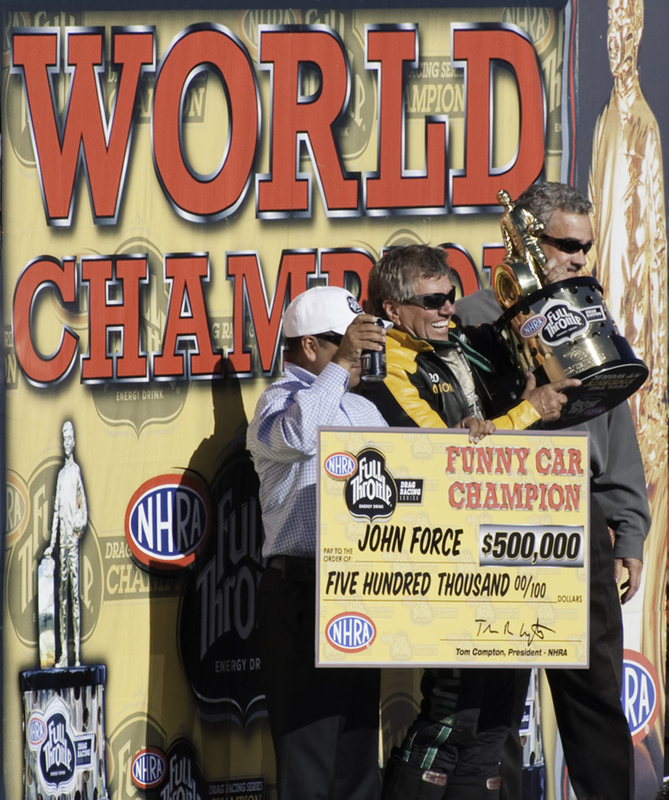 This entry was posted in NHRA Drag Racing and tagged Drag Racing, John Force, NHRA on October 14, 2012 by motorsportsphotography. The 2009 NHRA Auto Club finals was held under perfect sunny Southern California weather. Kenny Bernstein was honored before Sundays final rounds with a ceremony celebrating his 30 years in the sport with sponsor Budweiser. The world-famous Clydesdales were on hand for a last ride with the Bud King down the return road with a standing ovation from the crowd. Kenny was presented with his own Clydesdale horse.